Ah, the holidays… often an explosive blend of stress and relaxation! 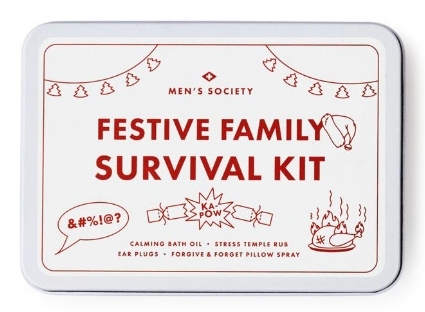 Izola’s Festive Family Survival Kit comes with calming bath oil, stress temple rub, ear plugs, and “Forgive & Forget” pillow spray. It’s a funny (and possibly too-real) item to include in stockings, Secret Santa, or office gift exchanges. Pair it with a bottle of booze and you’re set!